Yesterday, I went to work feeling completely naked. No, I didn’t somehow neglect to clothe myself. (I’m not *THAT* forgetful.) Instead, I went out without something very important to me. My watch. 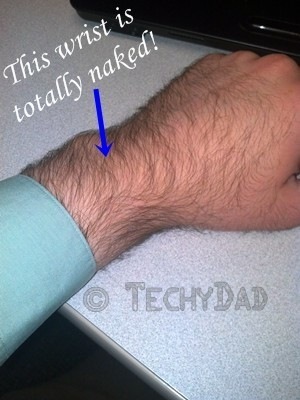 I feel completely naked without my watch. Sure, I could get my time from my phone, computer, car, cable box, or any of the other dozen clocks that litter my field of vision. Still, glancing at my wrist is a force of habit ingrained over the years. Unfortunately, the battery in my watch is dying. This means that watch keeps running slow. Even if I reset the time, it quickly falls behind. The only thing worse than no watch at all is a watch whose time you can’t trust. Until I get it fixed, the watch is staying off my wrist. What items (beyond "clothing") do you feel naked without? I feel naked without my wedding ring.